Building on the proven MBUS Pro platform, the MBUS Pro Offset Sights are part of an an effective aiming system to supplement magnified optics on M1913 Picatinny mounting surfaces. In the event of a damaged or nonfunctional primary optic, or a close target, rotating the rifle 45 degrees provides the shooter with a fully-featured iron sighting solution. The MBUS Pro Offset Front Sight features durable Melonited steel construction, positive detented lockup when deployed, tool-less adjustment of the front post for easy zeroing, and a low profile footprint to ensure compatibility and reduce interference with most rifle setups. Weight, w/ hardware: 1.8 oz. Height above rail at clamp: ~0.18"
Weight, w/ hardware: 2.0 oz. I am not only impressed with Magpul Offset sights, but Tom Tactical's price and service. AAA overall. I highly recommend. 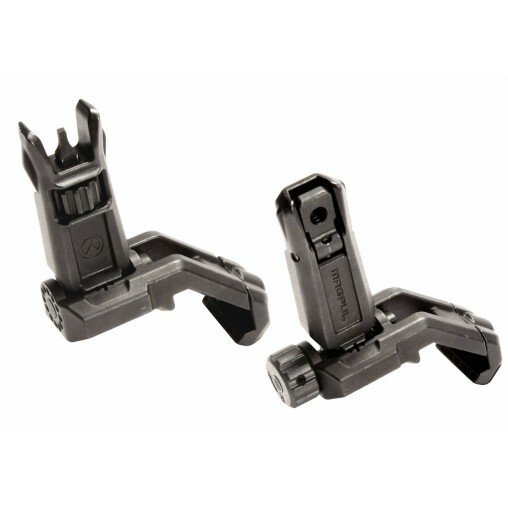 Great Magpul Offset Sights best price on the internet!! Super quick shipping and delivery, best price I've found,excellent sights. Great product, well built and really sturdy. I love these on my SBR as back-up sights. You can't go wrong with Magpul products. I also want to thank Toms Tactical. This was my first order with them and there service was outstanding. I will definetly order from them again.